Cut off the head and tail of the trout. Remove the spine, then open the trout and remove the other bones. Heat the white wine and infuse the saffron for about 5 minutes, and set aside to cool. Blend the filleted fish with the cooled white wine and the cream. Season and place in the fridge. Soak the morel mushrooms in hot water for about 10 minutes. Rinse them twice in cold water. Dry them a little, and then sauté in a pan with a little butter. Allow to cool and place in the fridge. Stuff the trout with the fish mixture; place the chilled morel mushrooms in the centre. Close the fish so that the stuffing is contained between the trout fillets. Steam at 85°C for about 25 minutes, or if using a thermometer, until the core reaches 58°C. Soak the spelt in cold water for about 2 hours. Take a saucepan and sweat the carrots and onion in the butter. Add the spelt and the vegetable stock. Bring to the boil, cover and simmer for about 25 minutes. Remove from the heat and let stand for 10 minutes. Mix the cider vinegar, Dijon mustard and rapeseed oil to make a vinaigrette. Add half the vinaigrette and the fresh herbs to the cooked spelt. Season with salt and pepper and set aside in the fridge. 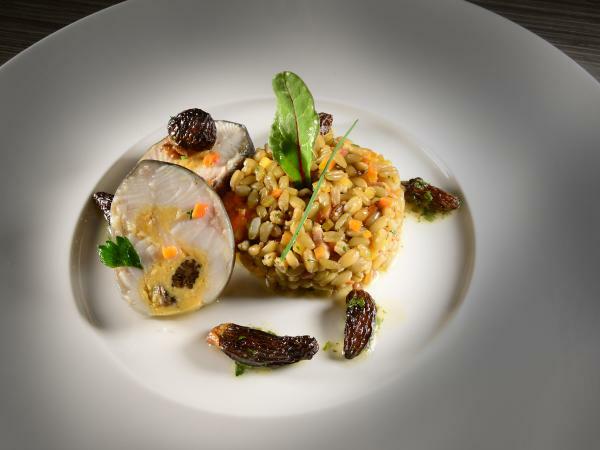 Place a serving of spelt salad in the middle of a plate with the help of a pastry cutter. Cut the trout galantine in slices about 1 cm thick (allow 2 to 3 slices per person). Arrange the slices beside the spelt salad. Garnish with a little lettuce or baby leaf salad; decorate the plate with a little vinaigrette.